When it comes to making a smooth, warming cup of coffee in the morning, you want a coffee maker that can provide a robust flavor. And since coffee is an essential part of every morning — which is usually a busy time of day — you need one that requires little effort on your part. There are hundreds of options for coffee makers out there, so where do you start? Well, that depends on what kind of features you want in your coffee maker. Things to consider are automation, convenience, the cleaning process and customization. It’s comforting to wake up in the morning and walk over your sleek coffee maker, dump some ground coffee in, hit a button and forget about it. If that’s the kind of convenience you’re looking for, along with a robust cup of coffee, then the Bonavita BV1900TS was made for you. This stainless steel coffee maker fits in perfectly with modern-day stainless steel appliances and only requires an inkling of space. This coffee maker has one job and it does it well: to brew a tasty, robust cup of coffee. The appeal of this coffee maker is the inherent simplicity. This is a one-touch brew coffee maker with an automatic turn-off so you are saving as much time as possible for those hectic mornings, and you never have to worry about leaving the burner on all day. This model produces an 8-cup pot of coffee and comes with a glass carafe that is easy to clean. Overall cleaning for the the BV1900TS is quite easy as the only parts that needs to be rinsed are the carafe, the tank and the filter basket. The key feature of the Bonavita BV1900TS is the precise 1500-watt heating system, which brews your coffee at the optimal temperature and keeps it piping hot at 198 to 205 degrees Fahrenheit. This ensures that your coffee never needs a trip to the microwave for a quick heat up, and even adding cold creamer won’t bring down the temperature too much. Optional Pre-Infusion Mode – This setting allows you the option to wet the coffee grounds before brewing. What this does is provides a better flavor by way of degassing the coffee before it is brewed. This only adds mere seconds to the brew time and enhances the flavor packed into the end product — your cup. Flat-Bottom Filter Basket and Wide Sprayhead – The flat-bottom filter basket combined with a wide sprayhead ensure better saturation of the coffee grounds for a more even extraction. With many other coffee makers, water comes out of a narrow drip spout and the very middle of your pile of coffee grounds is receiving the bulk of the attention. This leaves a lot of lesser-extracted coffee in the outer portions of the filter, which overall weakens the flavor and strength of your coffee. The Bonavita BV1900TS design solves this issue. 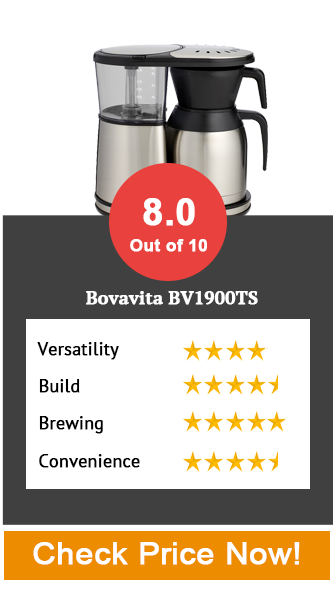 The Bovavita BV1900TS brews a delicious cup of coffee with minimal effort on your part. It’s partly customizable due to the option to pre-infuse your coffee grounds, but it is otherwise fully automatic. You’ll never have a problem with temperature as this model keeps your coffee at optimal temperatures for quality and taste. It’s a coffee maker made for those who want a delicious cup of coffee in the morning without all of the hassle. You’ll never have a problem with temperature as this model keeps your coffee at optimal temperatures for quality and taste. It’s a coffee maker made for those who want a delicious cup of coffee in the morning without all of the hassle. If you’re looking for a hassle free coffee maker for your early morning coffee dose the Bonavita BV1900TS is exactly what you need. It’s easy to clean and the 1500 Watt heating system ensures the perfect brew by maintaining optimal temperature.